A stole this soft, this warm and this light could only be made from Qiviut, the under-fur of the musk ox. This truly outstanding stole is handknitted by the Eskimo women of the Oomingmak Musk Ox Producers Co-operative in Alaska. 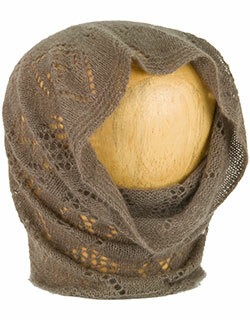 The stole is hand knitted in the Nelson Island Diamond Pattern. 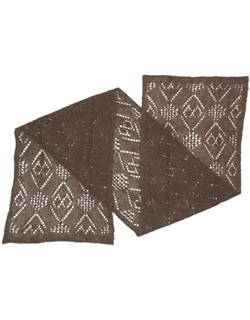 This pattern is knitted by cooperative members from Nightmute, Tununak, Newtok and Toksook Bay, a cluster of small villages near the coast of Kangirlvar Bay and is derived from a traditional design on parka trim. It is about 18 inches wide and 60 inches long. The color is natural brown. Hand wash, dry flat. 100% qiviut wool. Made in USA. Please note: Each stole is handknitted by a member of the Oomingmak Musk Ox Producers' Co-operative. Although the same pattern and number of stitches is used, the final measurements of the stole will vary with the tension of the individual knitter.